Why are some of us quick to take offense while others are more tolerant? Are you quick to take offense? Tolerance is a fair, objective, and permissive attitude toward those whose opinions, practices, race, religion, nationality, etc., differ from one's own. Although one can also talk about the tolerance paradox, where a tolerant person might be intolerant of intolerance, this is not such a bad thing. When two parties find themselves in disagreement and they are genuinely interested in resolving issues, disagreement could be productive. However, as it has been in most conflicts throughout history, the privileged side usually shows intolerance towards the less privileged side. There is a direct correlation between ignorance and intolerance. A carpet is large enough to accommodate two sages, but the world is not large enough for two Kings. 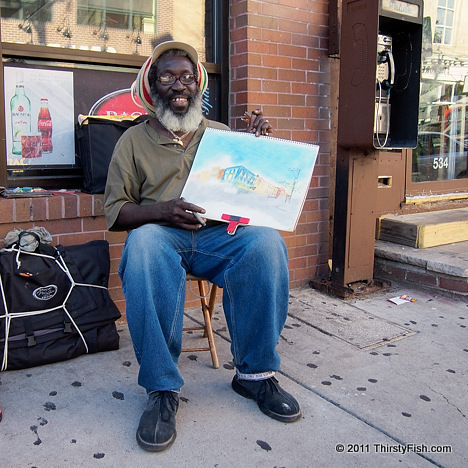 2011-11-27 Update: Today I had a brief chat with the photographed Jamaican artist, IKRU Warmaneasy. He is a talented poet, painter, sculptor and photographer.